Tanners Falls, 1.2 mi N. of, along rd. up W. side of East Branch; 150 ft S. of small brook; 80 ft W. of rd. ; in boulder; standard tablet stamped "29 M 1942". Elev. 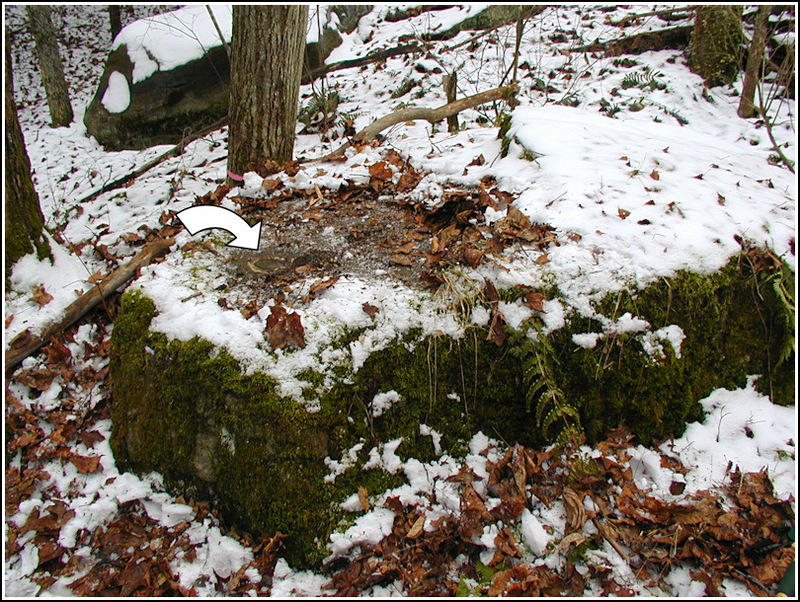 1080.615 ft.
Reference mark; 60 ft N. of tablet; 90 ft W. of rd,; on boulder; chiseled square. Elev. 1076.57 ft.
After finding Tanners' Condos and chiseled square 1102.46 nearby, we left the gamelands at Tanners Falls and traveled north along Upper Woods Road to approach the coordinates I'd approximated from the map for this mark. We were pleased to find a convenient SGL parking area directly adjacent to the mark! Once we stepped into the woods the location of the mark was immediately apparent. The trees surrounding the boulder were blazed with pink paint and/or encircled with pink flagging tape. The disk required some cleaning, but was otherwise in fine condition. The stamping is light, but legible. All measurements match those in the description. We did not search for the reference mark at this time. 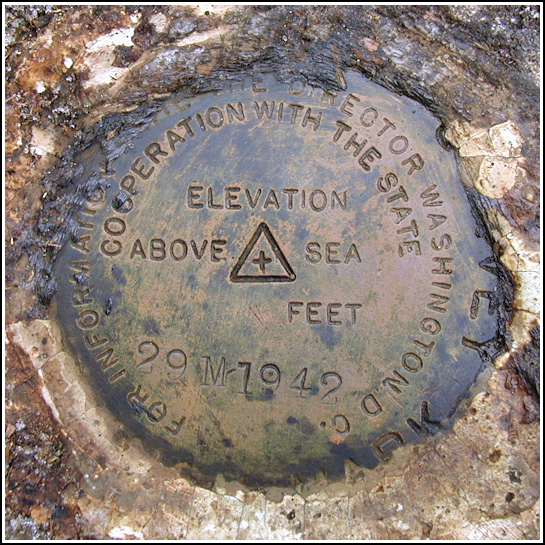 An eye-level view of the disk on the boulder. One of the marked trees can be seen in the background. 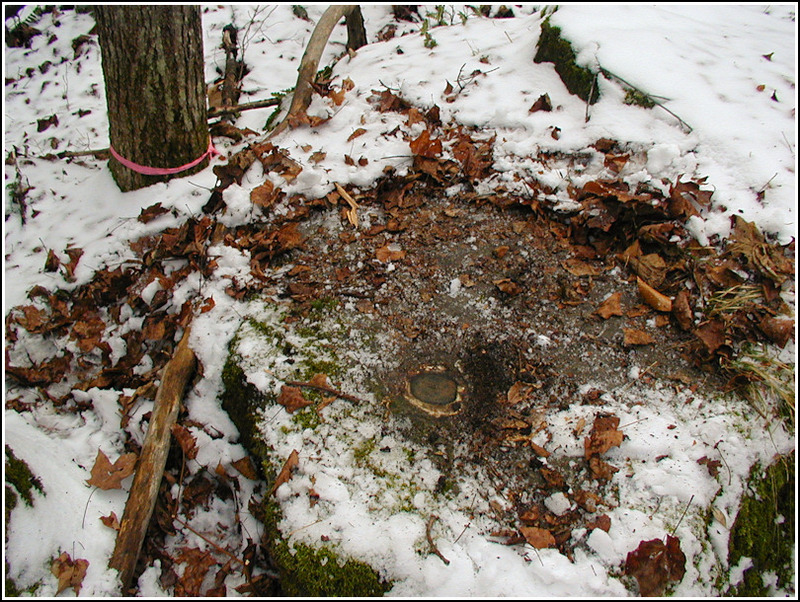 The disk is set in the top surface of the boulder about 18 inches above the level of the ground. Looking east toward SR4007 (Upper Woods Road). 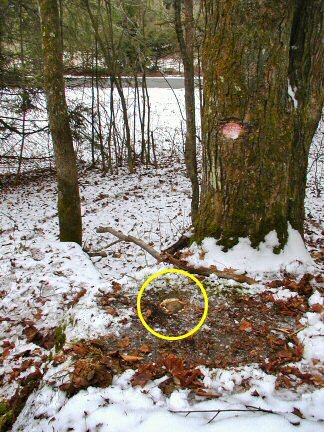 The pink blaze on the tree makes the mark's location obvious.